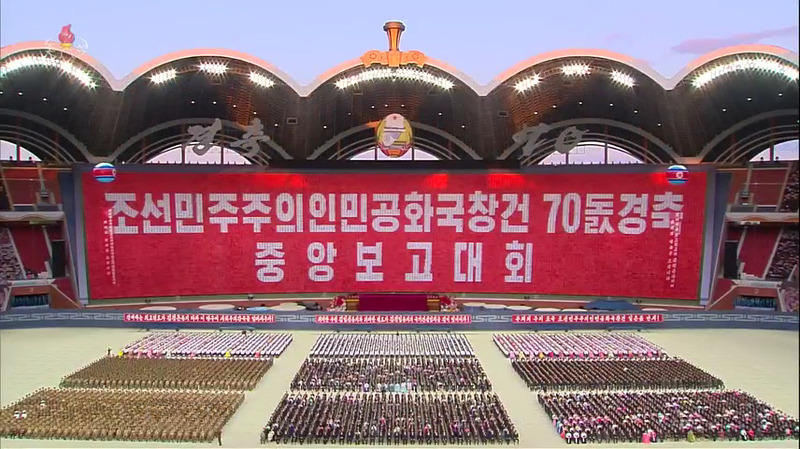 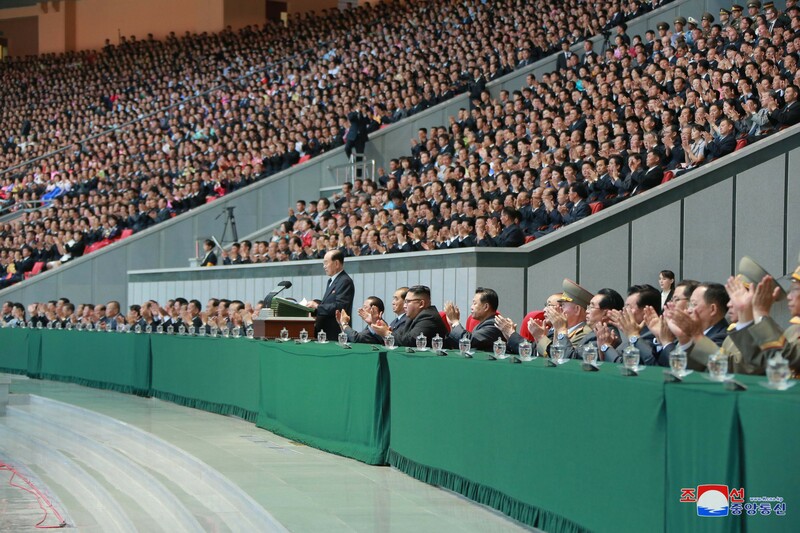 A central report meeting marking the 70th anniversary of the foundation of the DPRK took place at May Day Stadium in Pyongyang on Sunday (September 9). 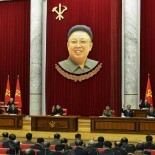 Report meetings were also held in provincial capitals, cities and county seats throughout the country. 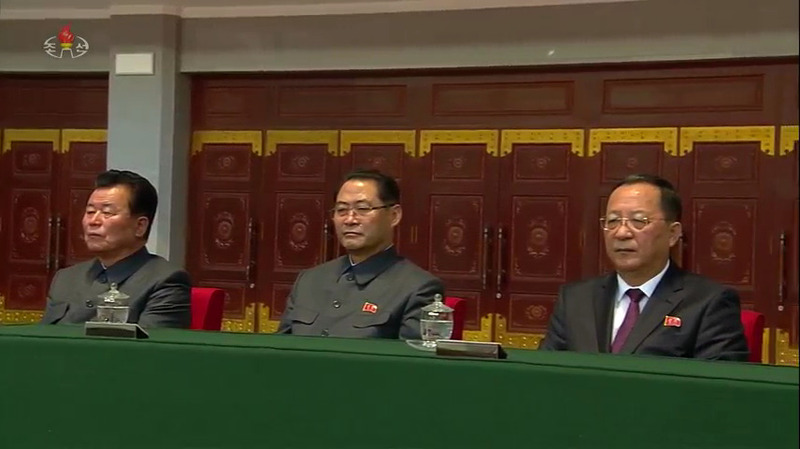 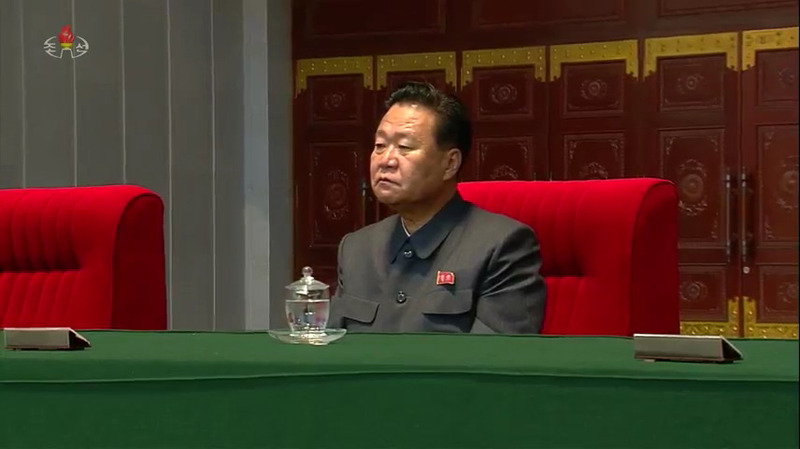 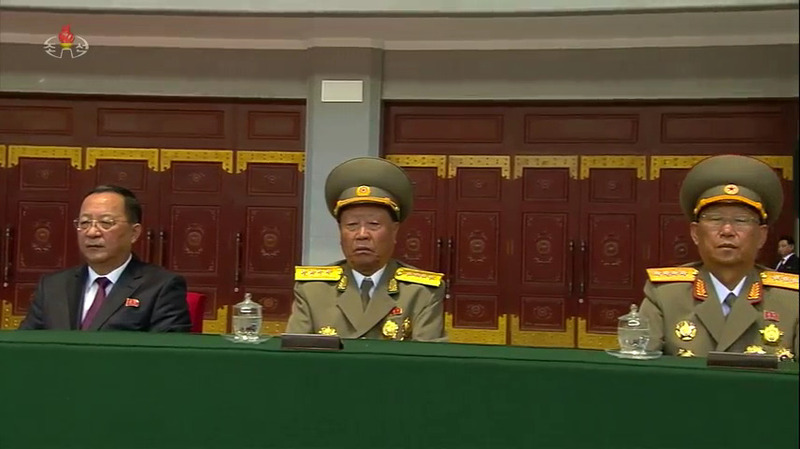 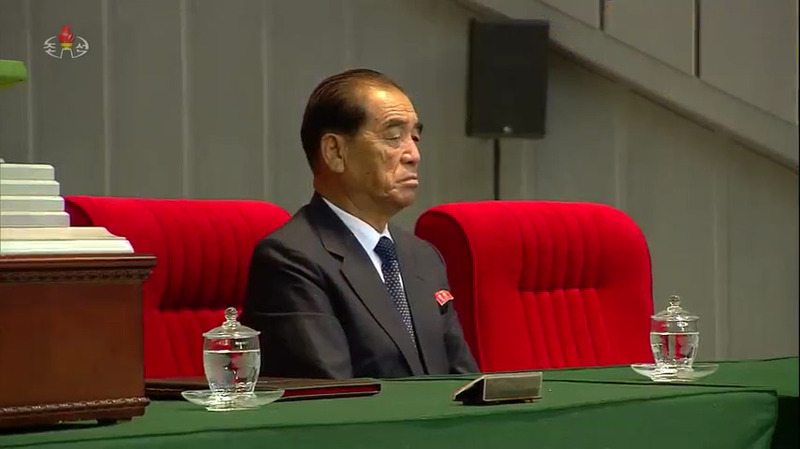 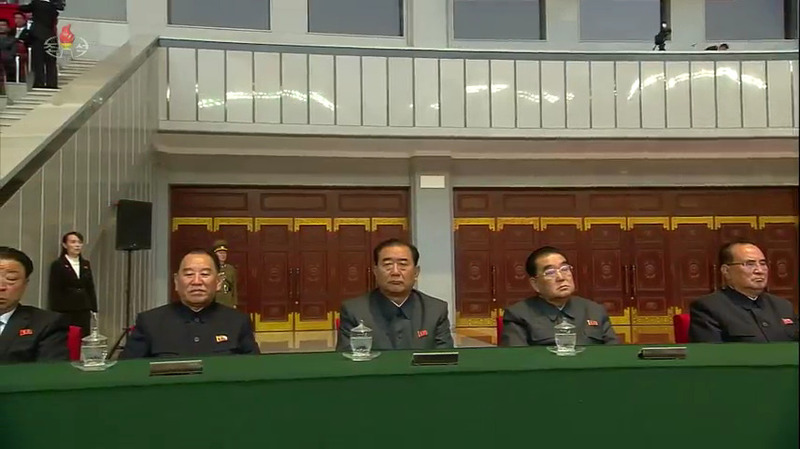 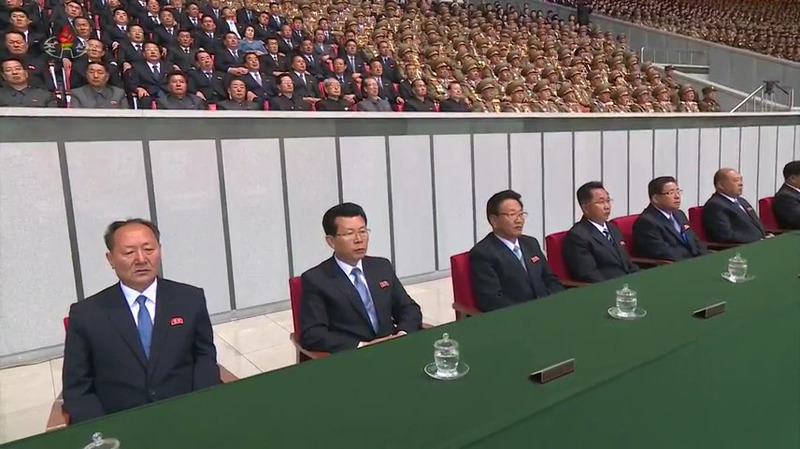 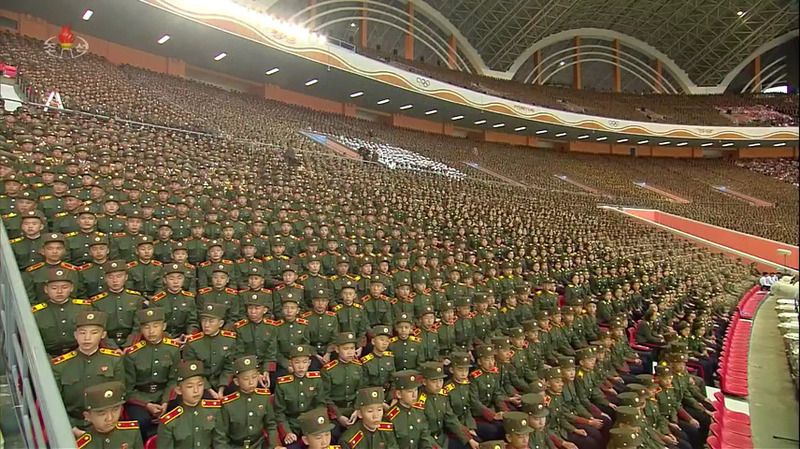 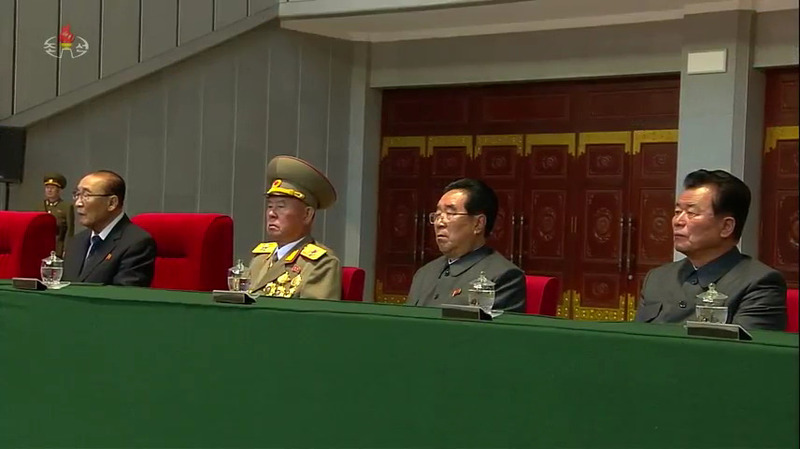 Kim Jong Un (Kim Cho’ng-u’n) presided over the meeting. 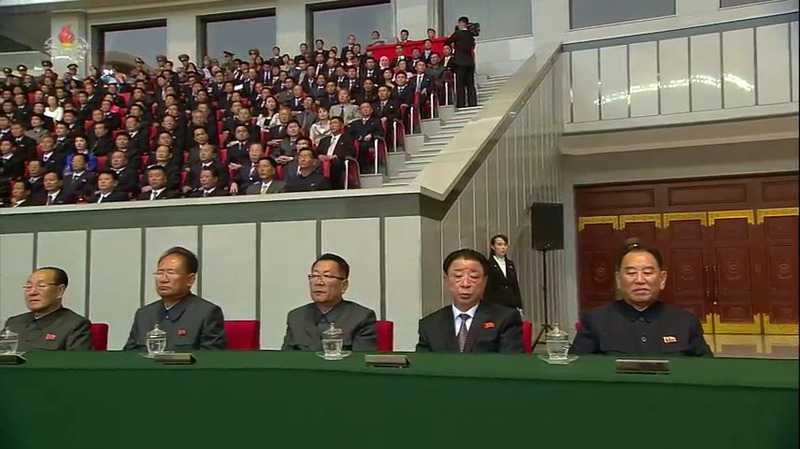 On the platform with him were members of the Workers’ Party of Korea [WPK] Political Bureau Presidium: Supreme People’s Assembly [SPA] Presidium President Kim Yong Nam, WPK Vice Chairman and State Affairs Commission Vice Chairman Choe Ryong Hae (Ch’oe Ryong-hae) and DPRK Premier and State Affairs Commission Vice Chairman Pak Pong Ju (Pak Pong-chu). 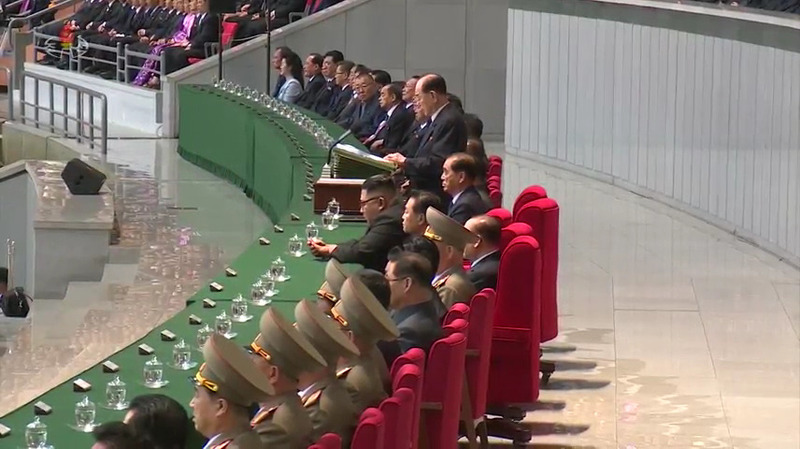 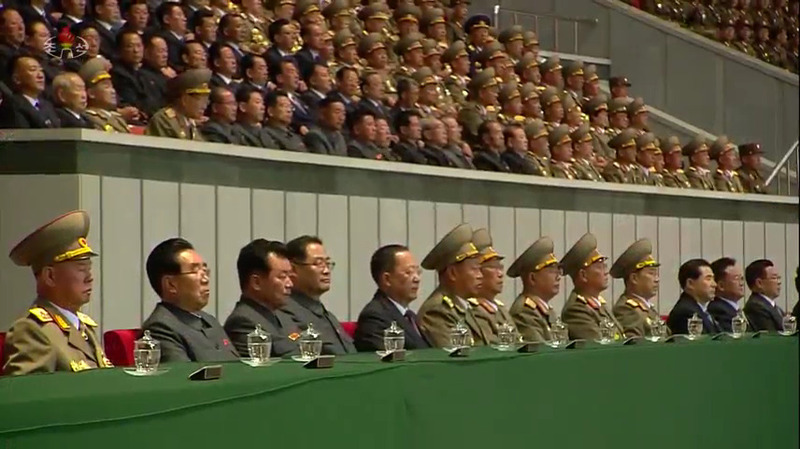 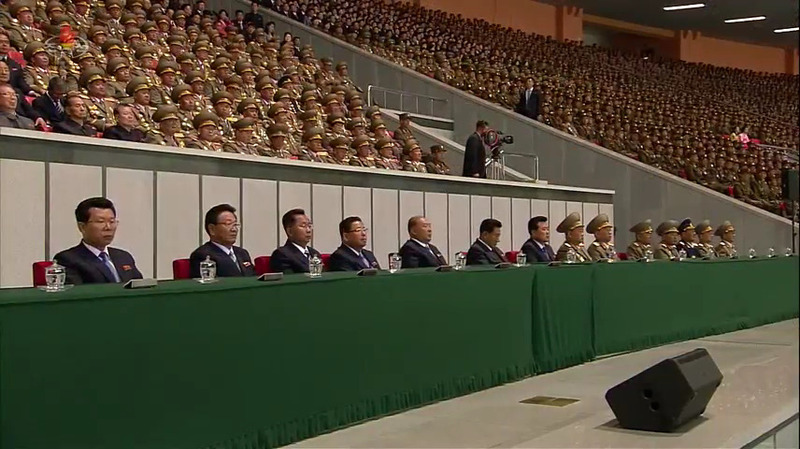 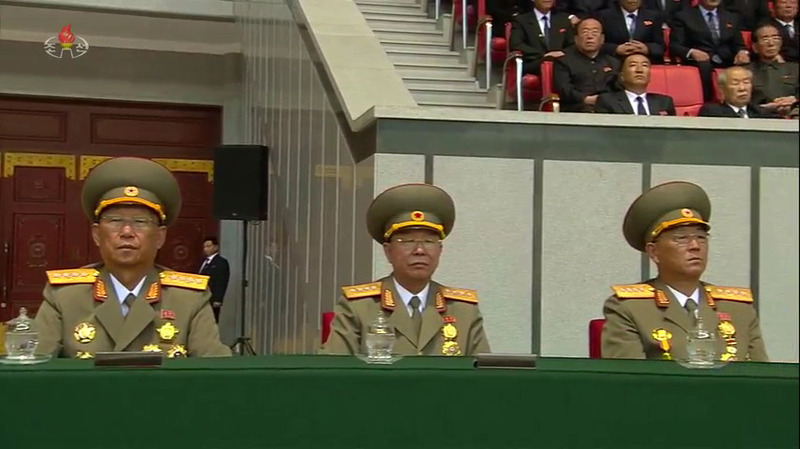 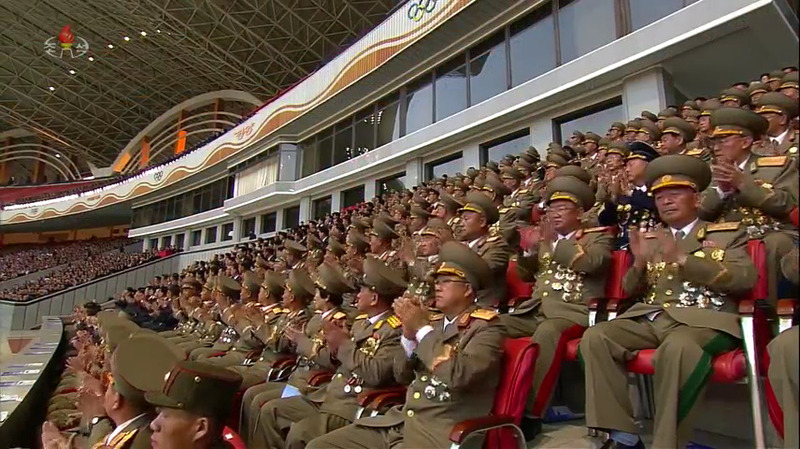 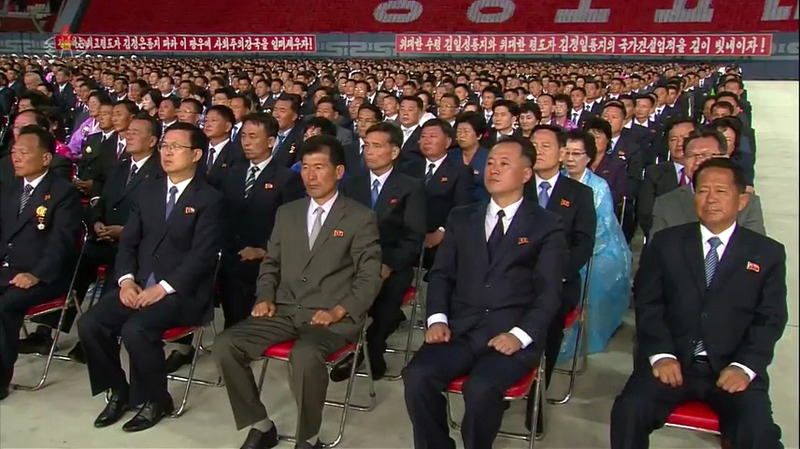 Also seated on the platform were WPK Vice Chairmen and Members of the WPK Executive Policy Bureau, Members and Alternate (candidate) Members of the Political Bureau, Provincial and City WPK Committee Chairmen, DPRK Vice Premiers, senior officials of the Ministry of People’s Security and Ministry of State Security, leading members of the Korean People’s Army [KPA] High Command, leading officials of Workers’ and Social Organizations and foreign VIPs representing overseas Korean organizations. 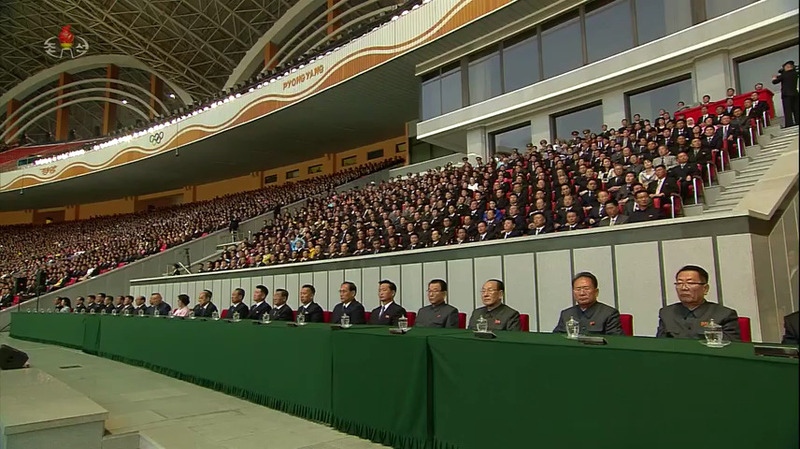 Also in attendance were senior officials of the WPK Central Committee and KPA, semi-retired senior officials, DPRK Cabinet Ministers and Commission Chairs, cadets of Mangyo’ngdae and Kang Pan Sok Revolutionary Schools, KPA and Korean People’s Internal Security Forces’ officers and service members, chief functionaries of education, cultural and research institutions, managers and cadres of industrial, agricultural and commercial institutions, various merited and titled DPRK citizens, Pyongyangites and the head of the Pyongyang Mission of the Anti-Imperialist National Democratic Front. 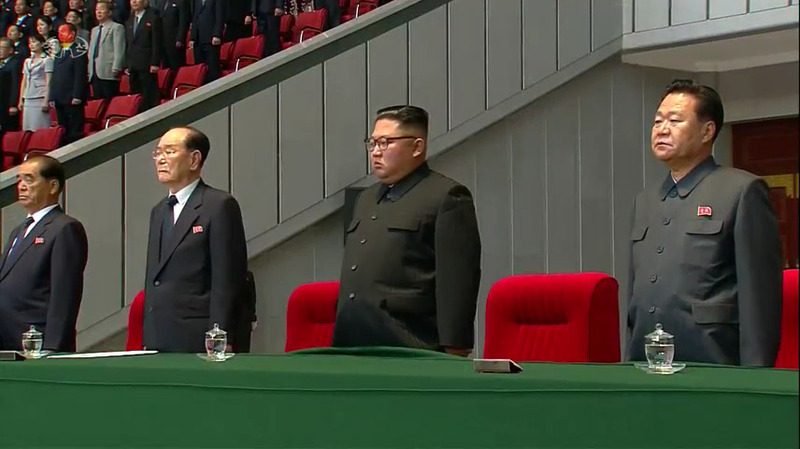 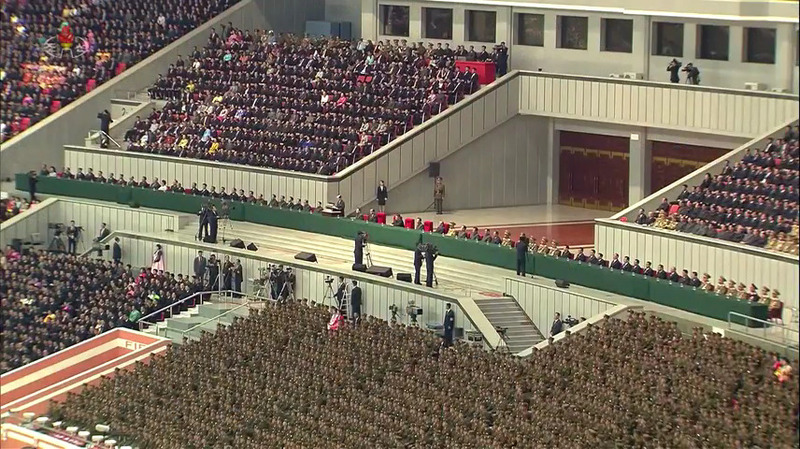 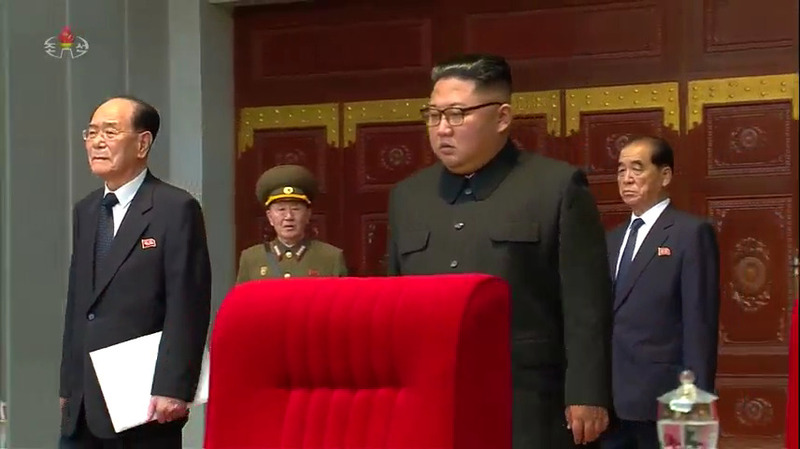 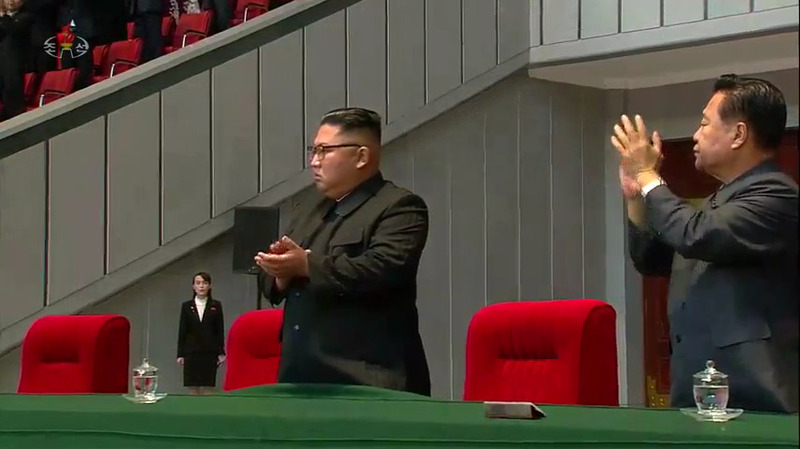 Kim Jong Un Un was accompanied to the event by Kim Yo Jong (Kim Yo’-cho’ng) and General Jo Kyong Chol (Cho Kyo’ng-ch’o’l), the director of the Military Security Command, who was directing Jong Un’s close security escorts for Foundation Day events. 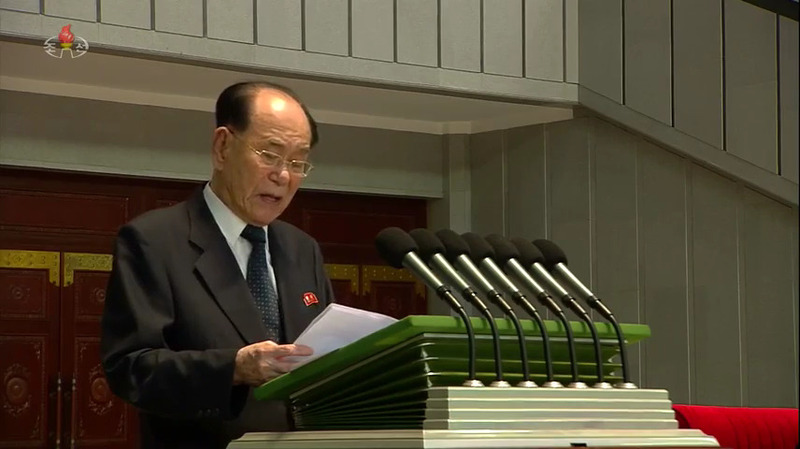 Kim Yong Nam delivered the report. 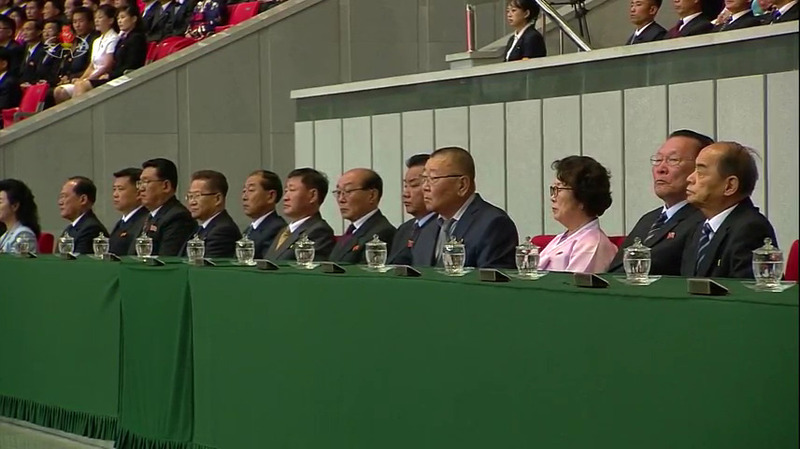 This article was written on 17 Sep 2018, and is filled under An Jong Su (WPK LID), Cadre Affairs, Central Broadcasting Committee, Central Committee, Central Military Committee, Central Party Affairs/Cadres 5th Section, Choe Hwi (PAD], Choe Jong Ryong [SHW WPK], Choe Ryong Hae, Col. Gen. Kim Hyong Ryong, Col. Gen. No Kwang Chol (KPAGS), Col. Gen. O Il Jong, Col. Gen. O Kum Chol, Col. Gen. Pak Jong Chon, Col. Gen. 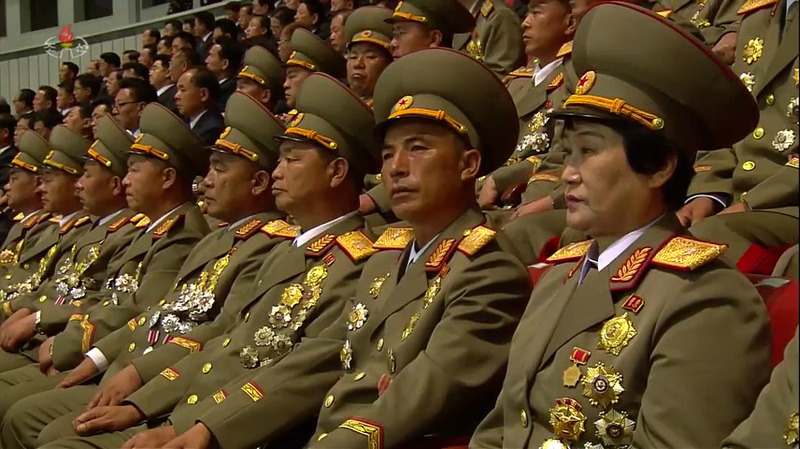 So Hong Chan, Col. Gen. 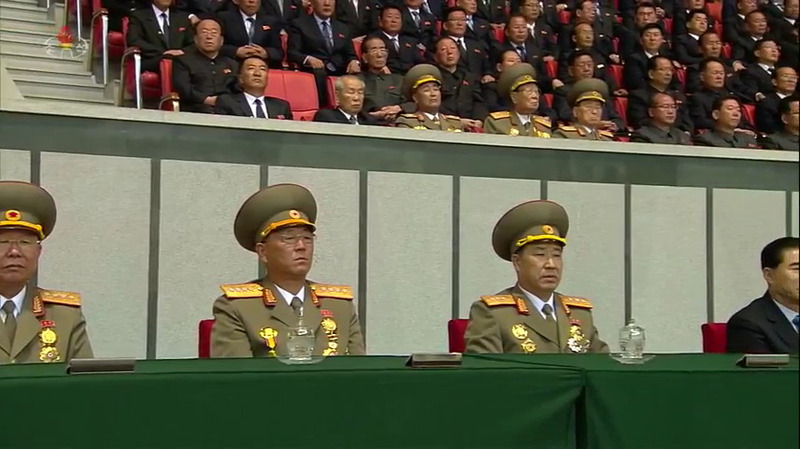 Son Chol Ju, Col. Gen. Yun Tong Hyon (MPAF), colonel general, DPRK 70th Anniversary (September 9, DPRK Cabinet, DPRK External Relations, DPRK Premier, Events Management Section, Executive Policy Bureau, Five Year Economic Plan and Development Strategy (2016), Foundation Day (September 9th), Gen. Choe Pu Il, Gen. Jo Kyong Chol, Gen. Kim Yong Chol, Gen. Ri Myong Su, Gen. Ri Yong Gil, Gen. Yun Tong Hyon, General Affairs, General Federation of Trade Unions of Korea, gsd, Guard Command, Hong Sung Mu, Hong Yong Chil (KWP MBID), ideological slogans, III Army Corps, Information Section, International Affairs Department WPK, International Department, Jagang KWP Provincial Committee, Jang Chol (State Academy of Science President), Jang Chun Sil (KDWU), Jo Yon Jun (OGD), Jon Il Chun, Jon Kwang Ho, Jong Kyong Thaek (State Security), Ju Yong Gil (GFTUK), Kang Yang Mo, Kangwo'n Provincial KWP Committee, Kim Chang Yop (UAWK), Kim Chong-un inspections, Kim Family, Kim Il Sung Youth League, Kim Jae Ryong (Jagang WPK Provincial Committee Chief Secretary), Kim Jong Un Visits, Kim Jong-il, Kim Jong-un, Kim Ki Nam, Kim Ki-nam, Kim Nung O (NPyongan WPK), Kim Phyong Hae (Cadres/NPYPPC), Kim Tu Il, Kim Yo Jong, Kim Yo-chong, Kim Yong Dae, Kim Yong Nam, kisyl, KJI Personal Secretariat, KJI-Ko Yong Hui Family, Korean Children's Union, Korean Committee for Cultural Relations with Foreign Countries, Korean Democratic Women's Union, Korean People's Air Force, Korean People's Air Force [KPAF], Korean People's Army Air Force, Korean People's Army Supreme Command, Korean People's Internal Security Forces, Korean People's Army (KPA), Korean Workers' Party (KWP), KPA General Political Bureau, KPA General Political Department, KPA General Staff, KPA infantry corps, KPA Large Combined Units, KPA Party Life, KPA supernumerary organizations, KPA Supreme Command, KPA WPK Committee, kpif, Kwak Pom Gi, Lecture Guidance, Lt. Gen. Ri Song Guk (IV Corps), LTG Kim Yong Bok, Ma Wo'n-ch'un (AD), Main Office of Adjutants (Central Party Office #6), Mangyo'ngdae Revolutionary School Alumni, Military Affairs, military security command [msc], Ministry of Culture, Ministry of Foreign Affairs, ministry of people's security, Ministry of State Security, Ministry of the People's Armed Forces (MPAF), MPAF GPB, Mun Kyong Dok, Namp'o WPK Committee, Navy Command, North Hamgyo'ng WPK Provincial Committee, North Hwanghae Provincial KWP Committee, North Korean press, North Pyongan KWP Provincial Committee, O Kuk Ryol, O Kuk-yol, O Su Yong, Organization and Guidance Department, Pak Chol Min [KISYL], Pak Jong Nam (Kangwon WPK PC), Pak Kwang Ho (PAD), Pak Pong Ju, Pak Tae Dok (N. Hwanghae WPK), Pak Thae Song (KWP CC Dept), Pak To Chun, Pak Yong Ho, Party elders, party life, Party Life Guidance, Political Bureau, primary party committees, Propaganda and Agitation Department, Provincial Party Committees, Provincial Party System, Provinicial People's Committee, Public Events, Public Information Commission, Publication Guidance Bureau, Pyongyang Defense Command, Pyongyang WPK Committee, Raso'n WPK Committee, Ri Chol, Ri Chol Man (DPRK Vice Premier/Minister of AG), Ri Hi Yong [NHAM WPK PC], Ri Il Hwan, Ri Ju O (DPRK Vice Premier), Ri Man Gon (N. P'yo'ngan WPK PC), Ri Sang Won (Yanggang WPK PC), Ri Su Yong, Ri Yong Ho (FA), Ri Yong Rae, Ro Tu Chol, Ryang Jong Hun [NHWA WPK PC], Ryang Won Ho (PHI), Ryanggang KWP Provincial Committee, Secretariat, Sin Yong Chol, South Hamgyo'ng KWP Provincial Committee, South Hwanghae KWP Provincial Committee, South P'yo'ngan KWP Provincial Committee, State Affairs Commission, State Planning Commission (SPC), State Security Department, Supreme People's Assembly, Tae Jong Su, uawk, VADM Kim Myong Sik (KPAN), VMar Ri Yong Mu, worker peasant red guard, Worker Peasant Red Guard, Workers' and Social Organizations, Yang Hyong Sop.